1Public Health Sciences Program, College of Public Health Sciences, Chulalongkorn University, Bangkok 10330, Thailand, ASIA. 2Department of Pharmacognosy, College of Pharmacy, Rangsit University, Pathum Thani 12000, Thailand, ASIA. Introduction: Bauhinia malabarica Roxb. is a tropical tree that found throughout Thailand. Leaves have a sour taste and have been used in Thai remedies for wound healing, diuretic, dysentery and emmenagogue. Objective: This study aimed to focus on pharmacognostic specification and quantitative analysis of quercetin and quercitrin in B. malabarica leaves. Methods: Various methods such as macroscopic and microscopic evaluations of B. malabarica leaf were studied along with physico-chemical parameters and quantitated quercetin and quercitrin using RP-HPLC. Results and Conclusion: Whole plant, structures of dried powder crude drug, cross section of midrib and leaf measurement were established. Paracytic stomata and multicellular trichome were found on lower epidermis. B. malabarica leaves from 15 sources throughout Thailand were examined the pharmacognostic specification according to WHO guideline. Physico-chemical parameters showed that loss on drying, total ash, acid insoluble ash and water content should not be more than 8.00, 7.08, 1.79 and 8.28 % of dry weight while ethanol and water soluble extractive values should not be less than 13.78 and 16.47 % of dry weight respectively. Quercetin and quercitrin were the markers for quantitative analysis using RP-HPLC with diode array detector in B. malabarica ethanolic extract. Quercetin and quercitrin contents were found to be 0.18 g and 0.38 g in 100 g of dried crude drug. Method validation was determined according to ICH guideline. All results were in the acceptable range and could be used for identity, safety, efficacy and quality of B. malabarica leaves in Thailand. 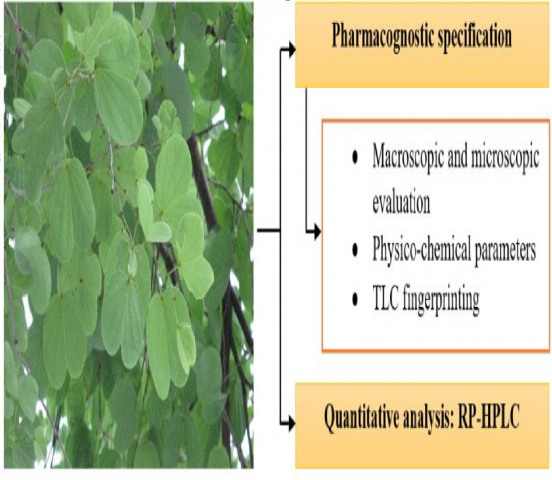 Thetsana P, Chaowuttikul C, Palanuvej C, Ruangrungsi N. Pharmacognostic Specifications, Quercetin and Quercitrin Quantification in Bauhinia malabarica Leaf. Pharmacognosy Journal. 2019;11(1):155-160.